Meet Athena. She is a tortie, and certainly has that Tortitude look with her expressions. Not this gal though, she is super easy going, playful, lovey lap cat. She is a small gal but holds her own with the boys. She has large golden eyes, and a big purr to match. Athena is goddess, and won't disappoint. She enjoys interactive toys and the usual cat toys as well. She likes to play hide and dart out to surprise her buddies. At the fosters home, she adores the cat tower that has hide away spots. 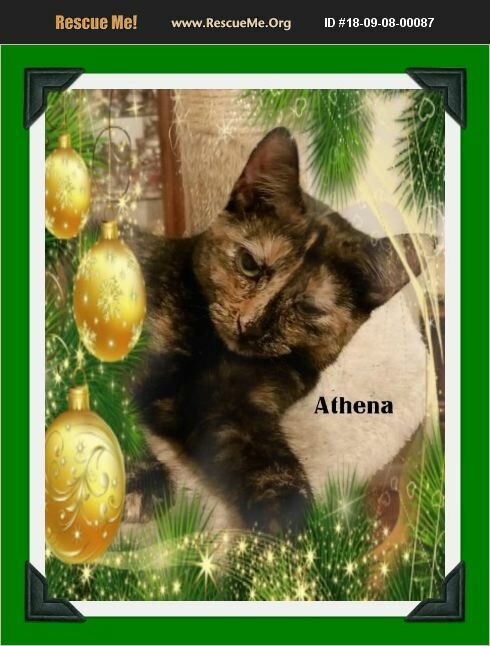 Come meet our Athena, she will melt your heart. She is spayed, tested for FIV and FeLV and is negative. We has been microchipped as well. We offer a 2 week trial adoption so you can make sure she is a great addition to your family, but you won't need it with this gal. Do not keep our little one unless you adore her. She deserves nothing less. Please view our other kitties, search Snow Camp Sanctuary. Thank you for viewing our rescue kitties!